If I tell you that my next entry is another tapa bento, would you roll your eyes and say, not again? I hope not because I don’t think this will be the last, seeing how much I love tapa. Tapa is a Filipino favorite, made of fried cured meat. Some make tapa using various meats like usa (deer/venison) and baboy ramo (wild boar), but the most popular will always be beef. 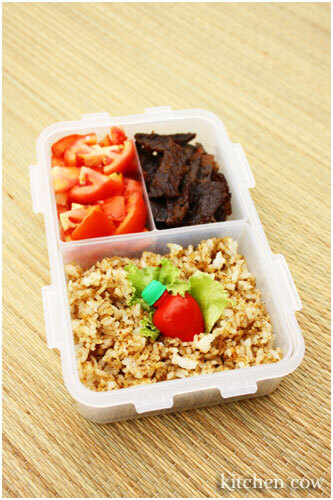 For this bento, I added tomatoes and fried rice, two of my favorite things to eat tapa with. I usually save around 1 tsp of leftover oil from frying the tapa, then stir-fry day-old rice in the same pan. I sprinkle a dash of rock salt then continue sautÃ©ing until the rice is thoroughly heated, with some crusty parts forming on the bottom. This is the sinangag (fried rice) I love. Eating tapa with this type of fried rice doubles the pleasure for me. No garlic for me, just good old tapa goodness. On the side, I diced some fresh plum tomatoes and sprinkle lightly with some rock salt. The fresh tomatoes add a refreshing bite that contrasts in taste and texture to the beef and rice. And if you’re wondering what that red thing on top of the rice is, it’s a small container of vinegar—the perfect condiment, adding a sharp sourness to the savory beef. Days like this, lunch truly becomes the high point of my day. And with a lunch like this, who can blame me? Well, that will make us happy, stuffed criminals. Not a bad thing, don’t you think? How does your mom make the tapa? Please ask your mom to share her recipe. Thanks! My husband doesn’t like the grocery-bought type of tapa. The tapa in the picture looks so appetizing. We make our tapa, yes but I’m hesitant about sharing the recipe because we use MSG, and I know how people feel about MSG. We avoid MSG as much as possible but tapa’s the one time we use it since it’s how my lola used to make tapa as well. Basically, she just sprinkles a mix of salt and MSG on the tapa then refrigerates for a couple of hours to cure.